There is so much confusion these days about baptism – so many people from so many backgrounds are saying so many conflicting things. For instance, is baptism necessary, or is it optional? Are we to be baptized by immersion or by sprinkling? Should we baptize infants, or is it intended only for those old enough to make their own decision to be baptized? So who is right?? If we can all agree that the Bible is the Word of God, then we know that when the Word speaks, we need to listen and when it doesn’t, we know it’s only a matter of man’s opinion. So what does the Bible “speak” about baptism? First, let’s understand the biblical word, “baptizo.” Since the New Testament was written in Greek, it helps us to know what the actual writers intended to say. The Greek word, “baptizo” is used to describe the act of being baptized. Baptizo literally means, “to dip, plunge, submerge, or immerse.” It was not a “religious” word. It was used, for instance, by the sailors of that day, of a ship that had been sunk. This is what the word looks like in the Greek: baptizo. When the Holy Spirit chose to use baptizo in scripture, He confirmed that neither pouring nor sprinkling were His intention. The Greeks had a word for sprinkling, it was “rantizo” (rantizo). It should be noted that while the words, “pour” and “sprinkle” (“rhantizo”) appear in the New Testament, they are never used for baptism. The practice of sprinkling for baptism gradually replaced immersion in the Catholic Church. It wasn’t until 1311, at the Council of Ravenna that the Roman Catholic church declared sprinkling or immersion to be indifferent. Now that we know the history of the word that is used throughout scripture, why does one decide to be baptized? 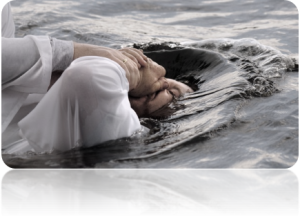 Baptism is our statement of faith…testifying that we recognize that we are sinners and that only through Christ’s death and resurrection can we be saved. Before one is baptized, they are asked to repeat Peter’s confession: “I believe that Jesus is the Christ, the son of the Living God” (Matthew 16:13-20). This public statement of faith tells the world where you stand, and it’s a reminder to the Christians who witness this that they, too, stand on the same foundational belief. Reading the rest of Acts 2:38, Peter replied, “Repent and be baptized, every one of you, in the name of Jesus Christ for the forgiveness of your sins. And you will receive the gift of the Holy Spirit.” This is the only scripture that teaches us how Christians can receive the gift of the Holy Spirit. Most importantly, baptism is for the…. All of this makes baptism…. There are many other things that could be said about the necessity of being baptized. But, perhaps this will help. The book of Acts in the Bible is the history of the beginnings of the church. It lists 10 stories of how people became Christians when the Apostles were still around – i.e. 10 conversion stories. So, how did they do it in those days, while the church was established according to God’s plan? Please look at the chart below. It shows what is specifically stated in each conversion story. Notice that occasionally it mentions they “heard” the preacher. Occasionally it mentions they “believed” the message. But in every case it specifically states that they were baptized. And, they never went on their way rejoicing until AFTER they were baptized. That’s because they weren’t Christians until they actually did that. Check it out for yourself! Don’t you think it’s time for the modern church to begin teaching what the Apostles taught? Baptism by itself won’t save anyone, but you can see that all these things are necessary for our salvation, including but not limited to baptism. With so many different opinions being expressed on this topic, we understand how confusing it can be to know the truth. It’s our hope and prayer that we’ve provided you with a Biblical foundation of the importance of baptism. This should clear up the confusion quickly! We are eager to help you and would love to “welcome you home” as a born-again Christian.